My grandmother and her younger sister. You have the best heritage photos! These are lovely -- and snapshots, to boot. I love the frames with them. Very pretty feminine touches of lace and pearls in your layout, and the red adds a nice punch to the soft neutrals. Lovely!! This is really beautiful! I love the torn border. Love these photos of Alice and Edith! I agree with Diane, you have wonderful heritage photos. I love the red glitter border you added. Thank you for making such a beautiful layout!!!! This is beautiful! The red pulls it all together and keeps everything else from just falling into one another. TFS! Beautiful - I love the touches of red, large and small. April this has such a vintage look that is perfect with the photos. 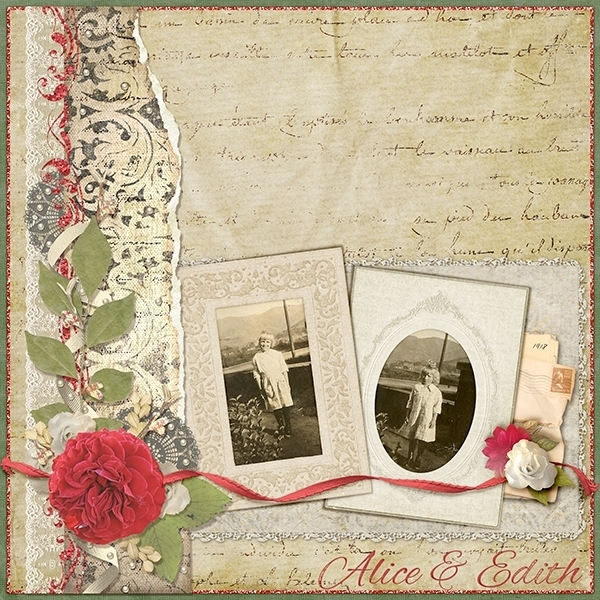 I love the torn border and vintage frames. Nice heritage page. u make amazing pages with your amazing heritage photos...i will be scraplifting this one..
wonderful showcase for this photo. Perfect choices.